Once a Victorian mansion, The Integral Urban House has been converted into a model of self-reliant living. In the middle of Berkeley, California, a 100-year old house was converted into a prime example of urban homesteading. Once a Victorian mansion, The Integral Urban House has been converted into a model of self-reliant living. For all the current talk about getting “back to the land” and becoming self-sufficient, darn few folks have taken the lead in showing urban residents—apartment dwellers and city homeowners—how they too can enjoy a more self-reliant way of life. One organization that is doing encouraging work in this area is the Farallones Institute of Berkeley, California. Here’s a report on just one of the Institute’s project: the conversion of a Victorian mansion into an urban homestead! Away out here in Berkeley, California—in an aging semi-industrial neighborhood—an enthusiastic group of “doers” has come together to restore (and display to the public) a 100-year-old Victorian house. What’s so unusual about that? Nothing . . . except that the stately dwelling—now known as the Integral Urban House—has become one of the country’s most innovative and successful “urban homesteads”. Half a dozen IUH residents grow their own fruits and vegetables, raise chickens, rabbits, and fish, recycle 90% of their wastes, solar heat their hot water, and conduct a variety of alternative technology experiments . . . all on a 1/8-acre city lot! “The Integral Urban House exists,” explains house resident Charles O’Loughlin, “to serve as a model for a more ecologically sound urban habitat, and to provide urban dwellers with physical and conceptual tools for creating a more self-reliant lifestyle.” In other words, the IUH staffers want to show by example how city folk can “live better for less” . . . while doing a good deed for the planet at the same time. The Integral Urban House is a project of the Farallones Institute, a non-profit organization founded in 1969 by a group of northern Californians interested in low-impact, non-resource-intensive living . . . among them Sim van der Ryn (now the official California State Architect) and Bill and Helga Olkowski (authors of Rodale Press’s City People’s Book of Raising Food). The Institute’s members bought their two-story Victorian building in 1974 and remodeled it inside and out during the following year. Now the structure is no longer just a house but the nucleus of a mini-ecosystem in which rabbits, chickens, fish, honeybees, plants, microbes, and people interact in a flourishing example of interrelated self-reliance. 2. The containerized rooftop garden. Proof positive that anyone, even apartment dwellers, can grow their own food! 3. The IUH garden, as seen from the roof. Crops are sown in raised beds that recovered with an inch of compost. 4.Members of a Saturday afternoon tour group stop to admire the IUH solar collector. 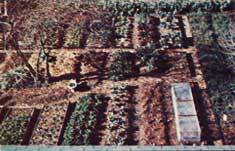 The variety of fruits arid vegetables raised on the 125′ X 60′ IUH lot is nothing short of astounding. Small avocado, fig, and quince trees stand above raised beds closely planted in potatoes, broccoli, lettuce, tomatoes, corn, peas, beets, carrots, celery, spinach, chard, and squash. Salad greens, scallions, and herbs are grown on the porch (adjacent to the kitchen), while nearby are perennial patches of strawberries, rhubarb, and asparagus. In addition, dwarf fruit trees— espaliered to the north wall of the house—will soon provide lemons, plums, and three kinds of apples. IUH staffers use no chemical fertilizers to bring forth this bounty of luscious edibles. Rather, a one-inch-deep layer of compost-made from kitchen garbage, rabbit manure, grass clippings, sawdust, and other wastes—is maintained on the garden’s beds to  act as a mulch which keeps weeds down and  make the soil light, airy, and rich in nutrients. (No tilling is ever needed.) And, thanks to laborsaving techniques developed especially for urban gardeners by Bill and Helga Olkowski, each IUH resident spends only 15 minutes per day in the vegetable patch . . . a regimen, certainly, that even the most work-shy city dweller could find agreeable! Because of the rich diversity of plantings in the garden, insects rarely pose a problem. (Small plantings of many types of crops tends to prevent mass infestation by any one kind of pest.) And when insects do pose a problem, biological controls—such as natural insect predators and specialized diseases that affect only the pest in question—soon “settle the hash” of the unwanted intruders. The Integral House’s food-raising efforts extend not only to the growing of fruits and vegetables but to the production of animal protein as well. The latter, in this case, means chickens and rabbits. All together, about 15 chickens—layers and fryers—inhabit the Institute’s urban homestead. Four hens live in a “composting house” on the roof, where—in addition to laying eggs within ten feet of the breakfast table—the birds produce rich manure for the compost heaps. The remaining cluckers are kept at ground level, on the shady north side of the old Victorian building. Some 10 to 20 rabbits, depending on whether or not a litter has been born recently, are also housed on the structure’s shady side. Commercial pellets, garden-grown alfalfa, and discarded produce obtained from a nearby market make up the bunnies’ diet. Rabbits are an ideal meat animal for the urban homesteader because they’re quiet, very little trouble to raise, produce high quality protein, and are easy to kill. This last point may not seem too important to some of you well-seasoned homesteaders. But if you consider how far-removed the average city dweller is from the life-and-death process of maintaining a food supply, you’ll understand that the “social acceptance of the slaughter” can sometimes become the most important factor in the decision when an urbanite chooses between raising his or her own food and buying it from a supermarket. All told, the scant handful of Integral Urban House rabbits and chickens produce a whopping 350 pounds of meat annually, at a cost of only 25¢ to 35¢ per pound. In addition, the hens lay about 1,560 (130 dozen) eggs a year, worth at least 50¢ per dozen . . . or a total of $65. To say nothing about the valuable manure (and—in the case of the rabbits—pelts) produced by this small livestock. That’s a pretty good bargain by anyone’s standards. Sterling Bunnell—the Farallones institute’s biological expert—manages an IUH aquaculture program, designed to determine if the production of fish and crustaceans can be made feasible for city dwellers. Bunnell has concentrated on raising native California water life—such as Sacramento blackfish, rainbow trout, and Pacifasticus (a genus of crayfish that can grow to lobster size)—in an experimental fish pond in the house’s small yard. At present, Bunnell is installing a biological filtration system designed to remove growth-inhibiting wastes (produced by the fish) from the pond’s water. The system is stunningly simple: It’s nothing more than a bed of oyster shells—coated with bacteria that feed upon (and filter out) impurities in the water—through which the body of water’s effluent is passed. If it works, the filtering system should significantly increase the yield (by weight) of fish from the small pond. Of course, no homestead—urban or otherwise—would be 100% complete without at least one beehive. And the Integral Urban House (as already mentioned) has two of them, located on a platform high above the fish pond. Bees are another ideal variety of city “livestock”. They’re quiet, they take care of themselves, and—most important—you don’t feed them . . . they feed you! Integral House residents recently harvested 35 pounds of delicious eucalyptus honey from their hives, and—according to Tom—the IUH bee operation yields several times that amount of the sweetener over the course of a year. A great deal of attention is given to the intelligent recycling of wastes at Integral Urban House. As a result, nothing (aside from those occasional bits of plastic packaging that everything from cheese to nails now seems to come in) is “thrown away”. Milk cartons become planters for seedlings, bags are re-used at the market, scraps of paper are burned in the wood stove . . . even garbage, human wastes, and dirty water are recycled right on the premises. Kitchen garbage, of course, becomes compost . . . but not until it’s been picked through by the chickens. The refuse is spread on the floor of the hens’ pen, which allows the birds to get an extra ration of eats while creating a valuable nitrogen-rich ingredient (chicken manure) for the IUH composting operation. Human wastes are also composted, but not in bins. Instead, the wastes decompose inside a waterless toilet known as the Clivus Multrum, which is approved by health officials in Sweden (where the device is widely used) but not-except in Maine, where water has been getting scarce lately—in the U.S. Local authorities have allowed the Integral Urban House to use a Clivus Multrum on an experimental basis. The toilet works, briefly, as follows: Excrement falls into a large, slatted fiberglass rank (which is vented to the outside of the house) containing a series of baffles. As the wastes accumulate, they slowly slide down the container’s sloping bottom from one compartment to another and undergo aerobic decomposition. After a two-year digestion period (to allow disease-causing micro-organisms a chance to die), the wastes can be removed from the Clivus in the form of compost. Nearly all the IUH’s hot water needs are met by a solar heater that can warm 120 gallons of water in an attic storage tank to surprisingly high temperatures . . . often past 170° F.
The 86-square-foot solar collector that is the heart of the system is the “Ritz of homebuilt collectors” and is expected to last the lifetime of the house. Doug Daniels, who helped I design the solar-powered heater, says the complete system—including storage tank and pipes (items that would’ve been required for a conventional electrically operated heater anyway)—cost around $900 to build, not counting labor. Taking into account the utility bills and maintenance costs associated with more traditional water heaters, Doug figures that the solar-powered setup should pay for itself in 10 years. A small electric water heater acts as an emergency backup system. (Although electric water heaters are less efficient than gas-fired units, the pilot light on a gas heater must burn continuously. And, since the IUH backup is called upon so infrequently, that would be rather wasteful.) So far, the electric standby has been used only three times . . . and even then it was relatively efficient since it was being fed water that’d been pre-warmed to 95° F by the solar heating system. Although Berkeley winters are relatively mild, one study has shown that the average home in that town uses as much energy for space heating during the winter as a residence in Minneapolis! The reason: In chilly Minnesota, people know the value of proper insulation . . . while in “sunny California”, insulation is—for the most part—used only as a last resort. Except, that is, for the Integral Urban House. Tom Javits feels that if a Berkeley home were properly insulated, it’d need little—or no—space heating. And he’s probably right, because last winter (before all its “extra” insulation was installed) the IUH had no space heater at all (a wood-burning stove is being added now), yet—except for a few frigid days—no one felt the worse for it. Within the building’s bathroom is a smaller version of Steve Baer’s Drum Wall: a bottle wall, in which one-gallon glass jugs—filled with ink-blackened water and supported in rows just inside the windows—serve as heat sinks that absorb the energy in the sun’s rays. At night, insulated shutters (outside the windows) can be closed to keep the bottles’ stored heat inside where it radiates into the room. As luck would have it, my own downstairs bedroom in the house (yes, I live here too!) is solar heated—quite effectively, I might add—by the adjoining greenhouse. Warmth radiates into my room during the day whenever I open a window between the two sections of the house. Much of the IUH cooking is done on a beautiful old combination gas and wood stove (equipped with an O-shaped—or doughnut—stovepipe that radiates into the room a bit more of the heat which would otherwise go up the chimney). The house also uses a large solar oven-built by a student—for baking casseroles or bread on sunny days. Most IUH staffers feel that wind and methane systems work best on a neighborhood or block level, rather than on an individual dwelling basis. For this reason, you won’t find any windplant towers or methane digesters on the IUH grounds. Occasionally, a visitor is surprised, disappointed, even annoyed, to learn that the Integral Urban House isn’t completely “self sufficient”. The fact is, though, that the folks here at the IUH don’t want their house to become an isolated haven in the midst of a city. (Besides, if a system—such as methane generation—is just plain inefficient on a household level, the IUH staffers would rather not use it . . . even if the alternative is to remain dependent—for the time being-on city gas or electricity.) Self-reliance— which has fewer overtones of isolationism and non-cooperation than “self-sufficiency”—is a better term for what the Institute is trying to promote. The Integral Urban House isn’t the only urban homestead around these days, of course . . . there’s also, among others, the Eco-house in London and Project Ouroboros in St. Paul, Minnesota. Thanks to such fine examples of self-reliant urban living, more and more solar-heated homes and community gardens are springing up across the country, and increasing numbers of city dwellers are learning to soften the sidewalk-hard reality of their lives with the feel of good soil, the taste of vine-ripened vegetables and truly fresh eggs, and the warmth of sun-heated water. Yes, you can live a more self-reliant, ecologically sound life—even in the city—if you want to. That’s what the Integral Urban House is all about. In the middle of Berkeley, California, a 100-year old house was converted into a prime example of urban homesteading. For all the current talk about getting “back to the land” and becoming self-sufficient, darn few folks have taken the lead in showing urban residents—apartment dwellers and city homeowners—how they too can enjoy a more self-reliant way of life. One organization that is doing encouraging work in this area is the Farallones Institute of Berkeley, California. 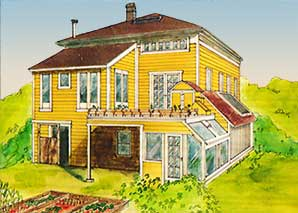 Here’s a report on just one of the Institute’s project: the conversion of a Victorian mansion into an urban homestead!Away out here in Berkeley, California—in an aging semi-industrial neighborhood—an enthusiastic group of “doers” has come together to restore (and display to the public) a 100-year-old Victorian house. What’s so unusual about that? Nothing . . . except that the stately dwelling—now known as the Integral Urban House—has become one of the country’s most innovative and successful “urban homesteads”. 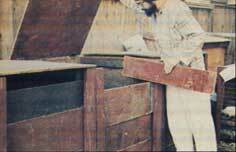 House resident Charles O’Loughlin inspects one of three wooden compost bins. The containers feature slatted sides, to allow easy removal of compost (which is ready to use after about three weeks of biodegradation). The containerized rooftop garden. Proof positive that anyone, even apartment dwellers, can grow their own food! The IUH garden, as seen from the roof. Crops are sown in raised beds that recovered with an inch of compost. Members of a Saturday afternoon tour group stop to admire the IUH solar collector.